In this free country piano lesson I’m going to teach you how to play a really famous country piano lick. You’ll hear this lick being used in thousands of songs so it will definitely be useful for you to learn. This lick was originally made famous by the great Floyd Cramer but many great piano players have played variations of it since then. Even though it’s technically a country lick it really can be used in other styles of music such as pop and rock. I’ve even heard it used in R&B, gospel, and even a little bit in jazz (think Vince Guaraldi). So, it’s definitely useful! Let’s get started learning it now (video lesson, notation, tips, and more below). Here’s a video demonstration of me playing and teaching this country piano lick. When you finish watching it scroll down for extra tips and the notation. 1. The chord progression I play in this country piano lesson (A, G, D) is a I bVII IV (I b7, 4) chord progression. You’ll find this chord progression in hundred of songs. It comes from the mixolydian mode. 2. If you just take a look at the notes on each individual chord they come from the major pentatonic scale. The major pentatonic scale is simply a major scale with the 4th and 7th scale degrees moved. If you want to learn more about major scale check out this lesson on major scale music theory. We will also talk more about major pentatonic scales on future piano lessons on this site. 3. The lick essentially is built around 2 major chords shapes. These are the root position chord and the first inversion chord. When I move my hand up and down the keyboard I’m essentially grabbing these chord shapes and letting my other fingers just naturally surround the other notes of the riff. 4. I play this lick using straight sixteenth notes but you could easily swing them if the groove of the song you’re playing has more of a swing feel. 5. You can hear this lick being used by pianists like Page McConnell from Phish, Bruce Hornsby, Norah Jones, Vince Guaraldi, Gabe Dixon, and many others. 6. If you love the pentatonic type sound of this lick I recommend you all check out this lesson on spicing up major piano chords using the 9th. It features a similar type of feeling. 7. I played this lick over 3 different chords n this country piano lesson but remember you can always chop of the lick and just play the pattern over 1 chord. 8. Additionally, you can just play the pattern that I play over the root position chord. Since these are pentatonic based notes there really aren’t too many avoid notes so you can change the riff slightly to fit into all kinds of different situations. Here’s the notation from this country piano lick over the 3 chords I use. I recommend you practice this pattern over all 12 major chords. Knowing how to play it in all 12 keys will be super helpful for you in so many ways. Not only is a cool riff but it will have an added bonus of helping you learn your major pentatonic scales. Additionally, if you’re still getting comfortable with your first inversion and root position major chords it will help with that too! From a technique standpoint make sure you keep your hands close to the keyboard when you do the octave shifts as well. It will help you keep better rhythm and control of your dynamics as well. I also recommend you try throwing the riff in over a song. Actually applying licks you learn to real songs is a fantastic way to really master a new lick. There are literally thousand and thousands of songs that it will work over. Pretty much anything with a major chord could theoretically work but if you need some suggestions here is a very short list. Notice this is a mix of country, folk songs, classic rock, and even some more modern pop. I told you it was versatile! 1. Don’t Know Why by Norah Jones. 5. Your Song by Elton John. 6. Bless The Broken Road by Rascall Flatts. 7. 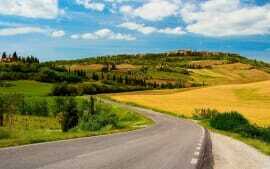 Country Road by James Taylor. 8. Family Tradition by Hank Williams Jr.
9. Crazy Love by Van Morrison. 12. Cowoby Take Me Away by The Dixie Chicks. 13. Whiskey Lullaby by Brad Paisley and Alison Krauss. There are many more songs but this will get you started. Have lots of fun with this country piano lick and let me know how it turns out for you! I hope you enjoyed learning this country piano lesson. If you have questions or comments please feel free to leave them in the comment section. I’m always adding new lessons to the site so check back often for new lessons. If you’re new here I recommend you subscribe to the Pianolessonsonline.com free email list to receive the newest lessons right in your inbox as soon as they’re published. You can subscribe on the top right of the site or right next to this article. Thanks and see you on the other side! Now I just learned the beauty of using the typical chord and the first inversion with the 2nd/9th note. I’m 65 and just retired, trying to pick up where I left off at 20. Took piano lessons using sheet music only for six years. I have an ear for picking out melodies but trying to figure out correct chords to go with them. I know all major scales and some theory. My dream is to playing cocktail lounges by 70! Can you help me please? Thanks! I have pretty much the same goals, only I’m age 72 and haven’t played much for 5 decades. I can play pretty much from a fake book but am struggling with voicings and playing suitable licks and riffs. Can I use this lick for ending a song? Hey Fabrício! Absolutely. It’s a lick that has a ton of applications. You can definitely be creative in where you use it. I was excited to see your country music lick by Floyd Cramer. I started working on it last night. I had intended to knuckle down and work on fundamentals this summer. Unfortunately I was driving down the road listening to the radio about 6 weeks ago when I again heard Last Date by Floyd Cramer, and immediately knew I had to learn how to play Floyd Cramer’s original version. So instead of fundamentals, I spent an enormous amount of time working on Last Date. At my level, it hasn’t been easy. If I had known about your Cramer lick before, I bet Last Date would have come to me much more easily. I thought I may have been using my time unwisely this summer, but actually I think Last Date was time well spent. I learned that playing Floyd Cramer’s notes and phrasing and inflections exactly right was critical. If not played just right, it often didn’t sound bad, but instead sounded a bit ordinary instead of sounding magical. I am sure the lesson learned, namely to perfect my playing when learning a song, applies to all music, not just Floyd Cramer.